As the poll season reaches its climax, the stage is all set for festival of democracy in India. In the 17th Lok Sabha elections, the biggest democratic elections in the history of mankind, about 900 million people will participate. Being harbingers of growth and partnerin- nation-building, we Chartered Accountants have an important role to play in this mega exercise. To me, the first and sure way of participating in the process of nation-building is to go out and vote. Democracy is not just about elections it is about the way of our life. Robert Kennedy says: Elections remind us not only of the rights but the responsibility of citizenship in a democracy. We need to conduct ourselves responsibly, as it’s our right, our interest and our freedom that is on stake through medium of the ballot. For us, regardless of who wins, election is a time for new hopes and new approaches. In our own way, we also help in bringing transparency in the political system of our country. Playing a crucial role, we have released the Exposure Draft of the second edition of Guidance Note on Accounting of Political Parties, thereby raising the bar on the quality of financial disclosures. Aiming to enhance transparency, governance and public accountability, the proposed Guidance Note is more elaborate and clear, incorporating the provisions of various Acts relevant to political parties of India and guidelines issued by the Election Commission of India. Meanwhile, I am also pleased to report that we have taken the process of adhering to our own tradition of internal democracy. After concluding the 24th Central and 23rd Regional Councils triennial elections in December 2018, the elections to Managing Committee of around 160 Branches of the Institute for the term 22-2019 have also been concluded. With the advent of a new Council at the Institute for the year 2019-20, various non-standing Committees and special-purpose Groups have been formed, to take forward the agenda of profession. Under the guidance of their respective compositions which essentially comprise my colleagues from Council, these are all set to take the profession forward and, in view of the Indian CA profession’s Vision 2030, these will follow its well-defined strategic priorities. Today, the challenges before the accountancy profession include growing expectations of public and the Government, growing awareness and inclination towards consistency in the quality of audit, increased regulatory and media attention and related concerns, shift to holistic reporting-organisational sustainability and organisations’ requirements of internal controls and assurance services, global regulatory disruptions, and increasing importance of good governance and ethical conduct. The profession will have to take on a bigger role in order to address all the above challenges. With its time-tested legacy of protecting the public interest and inspiring stakeholders’ confidence by example, the Institute will continue to be a trusted and an influential agent of accounting, auditing, ethical and educational standard-setting paving the way to highquality standards to be adopted and implemented, and will reckon to be a force that addresses the disruptive economic and technological changes in public interest. Through its technical Committees, the Institute will ensure that its professionals are driven and futureready with a right mix of innovative skills, new-age competencies and perspectives of ethics and integrity, as required to flourish in this rapidly-changing business environment. Education and training at ICAI will ensure that its newly-qualified Chartered Accountant professionals have the critical rudimentary sense equipped with a sceptical approach, while its professional fraternity will continue to be capable of suitably responding to the economic and socio-political drifts of their times, which impact the environment where they and their stakeholders exist together with an unquestionable professional ease. Whereas the accountancy profession globally stands at the crossroads of public scrutiny and trust, the Indian counterpart continues to intricately respond to the demands of the Government and its various organs strengthening its credibility and riding on the wheels of professionalism, ethics and integrity. Union Cabinet on 7th March 2019 has approved the renewal of the MoU between ICAI and the Institute of Chartered Accountants in England & Wales (ICAEW), under which ICAI members in good standing will be eligible to apply for ICAEW membership by passing the Advanced Level examinations and Ethics Learning Programme of ICAEW. This MoU will help us establish a mutual cooperation framework towards the advancement of accounting knowledge, professional and intellectual development, advancing the interests of their respective members and positively contributing to the development of the accounting profession in England & Wales as well as in India. As you know, we already have such MoUs of qualification reciprocity with CPA Canada, CPA Ireland, SAICA and CPA Australia. Another such arrangement with Chartered Accountants Australia & New Zealand is in the pipeline. I am sure, my professional colleagues will use these opportunities to enhance their professional growth. I attended the IFAC’s SMP Committee meeting on 25th- 26th February 2019 in the capacity of the Chair of SAFA SMP Committee, where I highlighted the capacitybuilding initiatives of SMPs (small and medium practitioners) being taken up at SAFA and at ICAI. I along with ICAI immediate-past President CA. Naveen N. D. Gupta also attended the IFAC Board meeting on 28th February 2019, which took the decision of awarding the 21st World Congress of Accountants (WCOA) 2022 to be held in Mumbai on 18th-21st November 2022. ICAI Vice-President CA. Atul Gupta attended the meeting of Chartered Accountants Worldwide (CAW) on 24th February 2019, where he shared the example of accounting reforms in Indian Railways, which was highly appreciated. Later, he also attended the IFAC Chief Executive Strategic Forum on 25th-26th February 2019. The need to improve the quality of financial management in public sector has been on the agenda of economies across the globe. This helps nations achieve fiscal discipline, transparency and accountability, and effectively manage their resources. Apart from assisting them in enhancing economic growth, this also helps decision-makers in bringing good governance to the system. To achieve the above objectives, meetings of Public-Sector Financial Management Committee of Confederation of Asian Pacific Accountants (CAPA) and ICAI-CAPA Joint Roundtable Stakeholders were organised on 10th- 11th March 2019 in New Delhi, where discussions were held on the status of public-sector financial management in India and the role of accountancy profession in improving the financial management in public sector. Former Comptroller & Auditor General (C&AG) of India Shri Shashi Kant Sharma was Chief Guest on the occasion. More than 60 senior officials from C&AG of India, Ministry of Railways, Ministry of Finance, Ministry of Housing and Urban Affairs, World Bank, Asian Development Bank, Department of Posts, and various Municipal Corporations of Delhi, among others, attended the meetings. I am happy to inform that the ICAI Accounting Research Foundation (ARF) has recently submitted the accrual-based financial statements of Indian Railways for the years 2015-16 and 2016-17 comprising the Statement of Financial Position and Performance, Cash-Flow Statement as on 31st March 2016 and 31st March 2017. The accrual-based financial statements as submitted by ICAI-ARF have been approved by the competent authority in Indian Railways. I acknowledge the efforts of ICAI-ARF team that had been led by the ICAI Vice-President CA. Atul Gupta. I along with ICAI Vice President CA. Atul Gupta and my other Central Council colleagues CA. Jay Chhaira and CA. Prakash Sharma, attended the Annual Conference for SCAs (Statutory Central Auditors) organized by RBI on 5th March 2019. 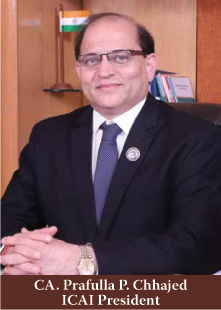 RBI Deputy Governor Shri M. K. Jain highlighted the fact that RBI was in the process of institutionalising a mechanism of structured meetings at quarterly intervals between senior supervisory managers at RBI and SCAs to build an effective relationship to further enhance the quality of banking supervision. We were informed that our recommendations as submitted to RBI’s Expert Committee on NPAs and Frauds, constituted under the chair of ICAI past President Shri Y. H. Malegam, were being examined for future actions and suitable advice to banks. This year, the automated application developed by Professional Development Committee of ICAI for the selection of Bank Branch Auditors has been used by 7 public-sector banks, i.e. Punjab National Bank, Central Bank of India, Bank of Baroda, Dena Bank, United Bank of India, Punjab & Sind Bank and Oriental Bank of Commerce. I am sure, this will address our concerns regarding the autonomy of banks towards their selection of Bank Branch Auditors, while making the process of allotment uniform, fair, transparent and equitable. I am confident, in the time to come, more banks will adopt this software. Unique Document Identification Number (UDIN) has been made mandatory in a phased manner, i.e. on certification done by practising Chartered Accountants with effect from 1st February 2019, on GST and tax audit reports with effect from 1st April 2019, and on all other attest functions with effect from 1st July 2019. Since 1st February 2019, more than 3.68 lakh UDINs have been issued. I request my professional colleagues to take note of the above schedule of mandating UDIN and adhere to the same while discharging their attest functions. A meeting of the Technical Advisors of Government Accounting Standards Advisory Board (GASAB) was held on 22nd February 2019, to discuss cash-based International Public Sector Accounting Standard (IPSAS), wherein support from ICAI has been sought in the formulation of certain guidance. Considering women the real architects of society, ICAI organised many programmes across the nation showcasing women’s strength and ability to face challenges of their times, on 8th March 2019 coinciding with the International Women’s Day, attracting overwhelming response from our women members. Former UN Secretary-General and Nobel Peace Laureate Mr. Kofi Annan has rightly said that the empowerment of women is the best tool for development. Union Minister of State for Law, Justice and Corporate Affairs Shri P. P. Chaudhary and Union Minister of State for Agriculture and Farmer’s Welfare Shri Gajendra Singh Shekhawat inaugurated the building of Jodhpur Branch of CIRC of the Institute on 6th March 2019. I along with ICAI Vice-President CA. Atul Gupta and my other Central Council colleague CA. Durgesh Kabra, among others, were also present on the occasion. I am sure, the building will help the Branch in extending better and more effective services to our members and students. 49th campus placement programme for the newlyqualified Chartered Accountants was organised during February-March 2019 at 17 centres across the nation, wherein more than 9000 registered for the programme. As on 22nd March 2019, a total of 141 organisation and 269 interview teams participated in the placement and they are expected to hire about 5,000 candidates across the nation. A total of 3,297 offers have already been made. I am happy to note that this placement programme has attracted the highest ever participation from recruiters offering highest number of positions since the inception of the Institute. Following the Preamble of the holiest of all holy books for Indians, the Constitution of India, it is the duty of WE, THE PEOPLE OF INDIA, to maintain the SOVEREIGN, SOCIALIST, SECULAR, DEMOCRATIC and REPUBLIC character of our nation which secures JUSTICE, LIBERTY, and EQUALITY, so that our dignity and our nation’s unity and integrity continues to flourish. Let’s ensure that the spirit of our sacrosanct Constitution continues to inspire all our endeavours throughout our life. We need to continue to uphold the trust bestowed upon us by our society and by the Indian polity and administration as agents of change and economic growth. Before I conclude, I congratulate everyone on the festivals of Mahavir Jayanti (17th April) and Good Friday (19th April) in advance. Lord Mahavir taught us the principles of nonviolence, truthfulness and non-possession or detachment from material things. It continues to be as relevant today and we need to imbibe those values as we celebrate such a festival that sends across a strong message of love, hope and peace to our society.